If the Discovery Channel can have “Shark Week,” why can’t Skinny Girls & Mayonnaise have “Crab Week”! It’s kinda the same except less terrifying and more delicious! Shelve your shrimp and save the lobster for the nouveau riche — crab is, hands down, my favorite crustacean. Even scampi scurry in comparison. I find myself revisiting the subject of crab on my blog often because it is one of my favorite things. 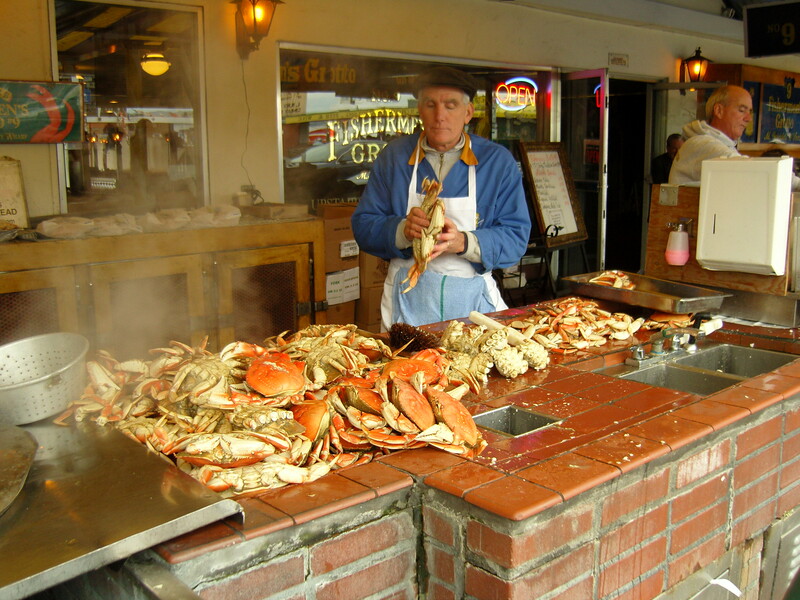 I have fond childhood memories of navigating through the crowded walkways of Fisherman’s Wharf in San Francisco, where large pots belched steam into the cold Bay air and Dungeness crabs were displayed in imposing piles taller than my head. That a creature so menacing looking could have such sweet, snowy white flesh was one of the wonders of the universe. Here in California, our Dungeness crab season just opened. Dungeness is the best crab. It’s abundant, reasonably priced and delicious! And I find myself wondering why the opening of Dungeness season isn’t front-page news. Certainly it’s more newsworthy than the resigning of the Greek prime minister or the Italian prime minister. Why is there not a crab parade somewhere? Why are there not crab celebrations at every restaurant, and crab feeds at every fire station and community center? Finally, crab is one of the most sustainable of seafoods — especially the two best kinds of crab, Dungeness and king crab. In some places they’re actually pests. So you’re doing a good thing for the world when you eat crab, too! On the video below, which I shot awhile ago, I make crab and corn bisque using blue crab. You could do the same with Dungeness or king crab. Last night, I made Baja crab cocktails (see recipe below) for a Mexican dinner with friends. Tonight it’s my son Flynn’s favorite, Japanese Tuesday, so I’ll make some fresh crab California roll and some crab tempura. I’ve got more crab tomorrow night, for one of my favorite pastas, linguini with crab and tomatoes. Soon we will leave on our annual Holiday road trip to Northern California to visit my mother and drag my own children through the crab-cluttered streets of San Francisco. I got my crab gene from Mom, and there we will celebrate crab season properly. Melt butter in a large soup pot over medium-high heat, and add onions and potatoes. Cook, stirring, for 5 minutes until they begin to brown slightly. Add water, bring to a simmer, and add corn cobs (with kernels removed). Simmer for 10 minutes, then add corn kernels, tomato and crab. Cook crab for 10 minutes, and remove from pot to cool. Turn off soup and let cool. Carefully pick through crab to remove meat from the shells (this will be much easier if you are using Dungeness crab or king crab). With a strainer, remove all solids (potato, corn, onion and tomato) from the soup to the blender. Add 2 cups of soup broth to blender, and half the crab meat. Puree until smooth. Return the puree to the pot with the broth, and set over medium heat until it begins to simmer. Add cream, turn to low and cover. Cook for five minutes, season to taste with salt and pepper. Keep warm until serving. Serve with a crusty bread, sweet cream butter and a hoppy beer like Anchor Steam or Sierra Nevada. Serve in small mounds on individual plates, surrounded by tortilla chips for scooping. Enjoy with an ice cold Pacifico or Corona beer, or a handmade margarita. Previous Lighten Up Next Thanks. Giving. My best friend works right behind that crab stand at the wharf! When I lived with her in SF she used to bring home two whole crabs for us every Friday, it was heaven! Up here where the crabs come in they do make the front page headline and every fire station does have a crab feast and this year the crab fishermen are still fighting with the retailers over price and they may not make the Thanksgiving deadline. Now that will be front page news for sure!! gotta get tested again..I love crab! Hey Sean, didn’t you know that November 22 is already “Alaskan King Crab Day”? Well, it’s been for me since my 15th birthday (1978). p.s. I need to try your tomatillo salsa, it’s my favorite on omelettes. Man, just give me one more reason to celebrate crab and I’m a happy man!